M1: [Bow] Joel Wilson,  Conor Burgess,  Mike Hoffman,  Neil Paul,  Algernon Wallis / Fletcher Williams,  Paddy Buchanan,  Andre Thunot, [Stroke] Lachlan Jardine, [Cox] Will Miller, [Sub] Fletcher Williams, [Coach] Moritz Schramm & Chris Smith, [Boat] Adrian Cadbury. M2: [Bow] Harry Ragan,  William Miller,  Tim Woodman,  Tim Martin,  Fletcher Williams,  Raphael Scheps,  Chris Diamand, [Stroke] Kert Putsepp, [Cox] Becca Odman Stonehouse, [Sub] Rutger Grisel, [Coach] Chris Braithwaite, [Boat] Vicky Wade. M3: [Bow] Ash Simkins,  Oisin Huhn,  Tom Waszkowycz,  Tom Beeby / Jonny Foster,  Ed Bentley,  Tom Watson,  Lee Nissim, [Stroke] Erik Wannerberg, [Cox] Ivan Tchernev, [Coach] Conor Burgess and Lachlan Jardine, [Boat] The Lady Jo’anna. W1: [Bow] Sarah Williams,  Alex Hayes,  Brioni Kate Aston,  Marijne Mak,  Beth Wratislaw,  Liz Dzeng,  Matilda Greig, [Stroke] Ellie Re’em, [Cox] Nicole Samuel, [Coach] Roger Thorogood, [Boat] Jolly Roger. W2: [Bow] Naomi Fenwick,  Nicoletta Knoble,  Anna Bachmann,  Vivienne Yang,  Felicity Eperon,  Kate Erin,  Katharine Russell / Leo Sharpston (Club President), [Stroke] Lucy King, [Cox] Colette Bane, [Coach] David, [Boat] The Shark. After three bumps for three days, M3 were determined to at least make it around a corner or two on their final day. And make it around said corner we did! But then we were bumped by Magdalene IV, who managed to gain rapidly once they got out of their start sequence. Spoons were accepted with bucket loads of general merriment from a crew who had clearly had a wonderful, if unsuccessful, week! Saturday started with some drama, when 15mins before we were due to meet at the boathouse we learned that 7 was being sick and wouldn’t be able to row – it was a panicked for a short time as we tried desperately to find a sub. It just so happened that Leo Sharpston, an alumnus, was at the boathouse for the ceremony in which the new Women’s First Eight was named after her – and she eagerly stepped up to the plate and saved the day! Homerton II had been bumped by Jesus the day before and we knew they were within our reach, but we expected to have a harder row than the previous two days, perhaps having to go halfway down the reach – which we were dreading as it was blowing a gale. So we determined that we should stop at nothing to catch them before then. We had our best start yet and were rowing powerfully, getting whistles at the same points as all the previous days. Homerton were able to hold us off slightly more successfully than the other crews we had chased, but not for long – we ground them down and had a spectacular bump right in front of The Plough and the crowds. It felt fantastic, and Leo especially was overjoyed! This got us to a final result of up three, W2’s best result in a long time. Once again today we started behind Selwyn W3. Feeling we hadn’t rowed our best the day before, we hoped to have a strong start and catch them soon after. We were being chased by ClareW4, who we had bumped on the first day so we hoped wouldn’t give us too many problems. At the cannon we started cleanly, soon settling into a strong rhythm and gradually gaining on Selwyn. We got within a length of them, but once again Selwyn seemed too strong and wouldn’t let us complete the bump. However, we were determined, and continued to push them, desperate to bump on the last day. Just as a row over was becoming inevitable, Selwyn took a bad line around Ditton Corner. Seeing our chance, Ben expertly guided us round after them, and with only a few hundred metres left of the course we lifted out of the corner hoping to catch them before the finish. Soon we had one whistle, and and determined to bump this time, we powered through to two whistles and then continuous. We kept going, and eventually bumped them just short of the railway bridge. Friday looked to be M1’s biggest challenge yet for several reasons. 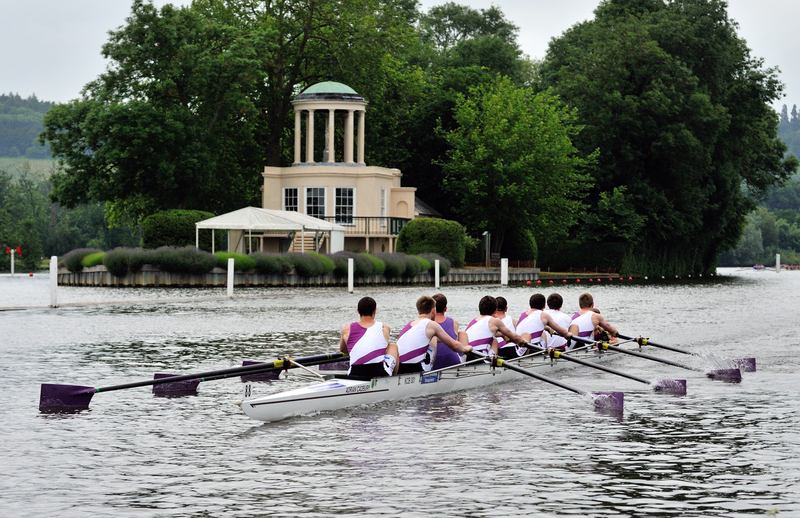 Firstly, the Christ’s M1 crew we were chasing had consistently beaten the crews we had so far bumped. Secondly the Pembroke M1 crew that Christ’s were chasing looked slow enough to give Christ’s an easy bump. Thirdly we had an enforced substitution just 4 hours before the race; the heroic Fletcher agreed to join his third bumps race of the day, after 2 rowovers with M2, in place of the incapacitated Alge, who was violently re-acquainting himself with his most recent meals. After an extended warmup to bed in the crew changes, we proceeded to have a very focused and aggressive row down. The crew were psyched up and raring to go; Joel in particular was taking this race personally and waxed lyrical about several historical incidents by which he felt Christ’s had wronged him. The gun saw us throw down our best start yet in an unpredictable wind. The whistles came more slowly than on previous days, as Christ’s showed the speed that had made them a top 10 crew. Slowly we reeled them in, taking the distance to half a length on the exit of a very neat Grassy corner courtesy of Will. From there on we powered on and ate up the remaining distance. We overlapped a few strokes on from Ditton Corner and finished off the bump 100 meters down the long reach. The sense of achievement was palpable as the crew congratulated each other; a bump on Clare M1 tomorrow would round off a fantastic year with the rarity that is first-division blades. Bring it on. The crew was now back to how it had started on Wednesday, so there were no excuses from any subs. The usual warm ups were performed and the crew seemed eager to get going. Despite being bumped by Girton M3 the previous day, the crew was fairly confident that if it really pushed hard and kept tidy, it could bump Girton back and end the less-than-desirable run so far. Things were looking promising as cox Ivan called a practice standing start – resulting in the best start performed so far. The second practice start wasn’t quite as good but that was quickly brushed over. For King’s M3, the race was now to start underneath the motorway bridge. Unfortunately there was a risk it was going to rain so the cannon was also under the bridge – meaning a defeaning blast that required you to “defend your ears!”. John Aspden was there to give M3 the most inspiring speech of the week, which really boosted confidence, and it left the crew feeling more determined than it had been all week. Friday saw us row basically the same course as Thursday, but with less carnage! After nearly overbumping St. Ed’s on Wednesday we were confident we could catch them, it was just a matter of where. St. Ed’s were very weak and weren’t even straight to start with, meaning we took a lot out of them very quickly and just kept taking. We bumped them at Grassy, a more satisfying bump than Thursday’s technical one! After rowing over yesterday, we were keen to avoid a repeat experience. With Robinson W2 behind us having pulled out, we had a larger gap behind us so little danger of being bumped. Keen to capitalise on this and catch Selwyn W3, we had a good start, gaining on Selwyn from the outset. On hearing a whistle it seemed our plan was going well but Selwyn, alas, had other ideas. They responded to our pressure well, pulling away from us and increasing the gap. We tried to close the gap, and again got within a length of the Selwyn boat, but couldn’t quite catch them. After this our heads went down and we ended up chasing them to the finish line, with both crews rowing over. Following a very good row down to the start, M1 were confident of a second bump against a Fitz crew that always looked precarious in the top division. A much improved start saw us quickly pull away from the Emma crew we bumped yesterday, and drive on at a very good speed. The conditions were much improved from the first day, and we hit a strong powerful rhythm, moving steadily through one, two and three whistles. We had discussed a final killer move, and Will’s coxing calls were spot on as we accelerated into an overlapping position with Fitzwilliam, their cox being forced to concede halfway round first post corner. After a disappointing first day of bumps, King’s M3 were pumped for a shot at the revenge bump or the very real possibility of an over bump. Things looked even better when Willer got inside information, that Girton were aiming for the row over i.e. did not believe they were capable of catching the mighty King’s M3. This King’s boat looked slightly different from the wednesday crew, with some of M2s lent bumps rowers stepping up to add a bit of experience and hopefully a calm head. Being bumped the day before meant we were even closer the deafening Canon Blast, which definitely got the blood pumping. As we sat, charged with energy on a blustery afternoon. The sounds of the great escape whistled over the cox box. Bang, the draws and winds built up. Perhaps not as clean as the day before but the boat was moving. Ivan’s triumphant Rhythm 9 heralded M3’s PB in May bumps. Sadly it was not enough, the Girton boy’s were getting closer, as they received their first whistles we spooked. The rowing fell apart somewhat and it wasn’t long before they had got the bump. We cleared professionally, and were still struck by the Clare boat clumsily passing through. Followed by some of our better steady state rowing back to the boathouse. Friday brings the opportunity for the revenge bump on Girton and hopefully testing out Ivan’s ability on the corners. After rowing the whole course on Wednesday, we knew we were capable of it and therefore felt more relaxed about the possibility of doing it again. However, we reasoned that if Jesus W3 could catch Peterhouse, we definitely could! We were on them right from the start and were gaining on them all the time down the Gut. At Grassy the marshals told us to steer for the outside of the corner due to blockage on the inside, but in fact there was a bit of a pile up on the outside, thanks again to Jesus. This meant that we had to hold it up just before the Peterhouse cox conceded, even though we had overlap and the bump was inevitable! For a few horrible minutes in the chaos we weren’t sure whether or not the bump would be awarded. But sure enough, the Umpires agreed with us that the Bump was inevitable and awarded us a technical bump on Peterhouse W2. W3 came to the second day of bumps feeling reasonably confident in our ability to, if not bump, row over solidly. After a stronger start than on the first day, we began closing the gap between us and Emma IV. Unfortunately, Emma was able to bump Selwyn III, leaving us rowing for the overbump on Clare III. Despite valiant efforts from the crew, the gap with Clare wasn’t looking likely to close. At the same time, Queens IV was looking to overbump us. We weren’t about to give up the fight though, and had a very strong and solid row over, retaining a good gap between us and Queens over the line. On to chase Selwyn III! After a solid row down, and buoyed with confidence by some great sessions in the preceding week, M1 pushed out into a strong gusting headwind on the first day of bumps with optimistic excitement. After an hesitant first few strokes, we hit a strong rhythm and quickly moved up on the Emmanuel crew. one minute in we were just 6 foot away, but Emma gave it their all and it took another minute to get the bump, finally hitting them at the exit of first post corner. We took plenty of encouragement from a very satisfying row, but also look to improve on certain aspects as the week continues. Greeted by grey skies and brisk winds, the first day of May Bumps was not too welcoming for an M3 that had previously rowed together not once, not twice, but a whooping zero times. The crew was not downcast however: most of them had been in the same boat not more than two and a half weeks (and many exams) ago, and felt confident that they could probably row as well now as then. After a series of practice starts both on erg and water that had gone surprisingly well for the amount of training, the crew arrived at position number five, two positions upriver of the motorway bridge – thus already two positions higher than they were originally, due to two boats dropping out. The scene was thus set for a blazing start of the week, with Sidney Sussex II ahead, and Queens’ IV behind. Following a four-minute gun loud enough to make those fresh to Bumps jump, the crew made themselves ready: de-kitting, last drinks, adrenaline levels rising. Another blast from the one-minute gun, another fourty seconds, and the boats were pushed out in the river, late to avoid too much of the headwind before the start. BANG! and the start was on: the crew took three solid draw strokes, and five quick winds. During the three lengthens, however, it was already apparent that the quite heavily built Queens’ IV crew had done the same, and they had thus closed in by half a boatlength: a whistleblow was heard. Tremendous effort from the King’s men could unfortunately not hold them for very long: the one whistleblow was soon two, and three, as the Queens’ boat surged forward. Before twenty strokes were taken, the bump was a fact, and the boats steered to the bank. Although we knew that on paper we were a lot better than Jesus W3, we also knew that in Bumps anything can happen – so we went out just prepared to do our own race, and hopefully they would come to us. This paid off when Jesus bumped a weak Peterhouse W2 as they took a poor line around Grassy, just before we could catch them, and we decided we were going for the overbump on St. Edmunds W1! Jesus spectacularly failed to clear and sat in the middle of the river, causing us to have to restart. Despite all the confusion and a slightly messy start we settled into a good rhythm by the Plough. On the Reach we hoovered them up to within a length by the railings but they managed to hold us off, the time wasted thanks to Jesus allowing them to narrowly escape us. Despite being denied a bump we felt pleased with the quality of our rowing, although extremely tired after having rowed the whole course at high rate! The first day of bumps was a successful one for W3, proving that we did deserve our spot in the division with a very quick and decisive bump. Despite a rocky start, W3 quickly closed in on Clare IV, bumping them before the motorway bridge. Such a quick bump took us by surprise, leading to a scramble in an attempt to clear the river. Unfortunately, in the ensuing aftermath a rather dramatic collision occurred with Selwyn III, which was already half on the bank. All worked out for the best, with a very happy W3 heading back to the boathouse. 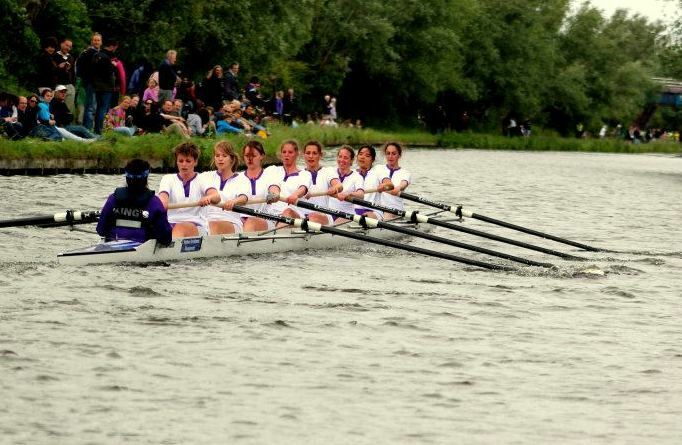 May Bumps 2013 – Division times, Marquee and Boat Naming! This year’s May Bumps run from Wednesday 12th June to Saturday 15th June. 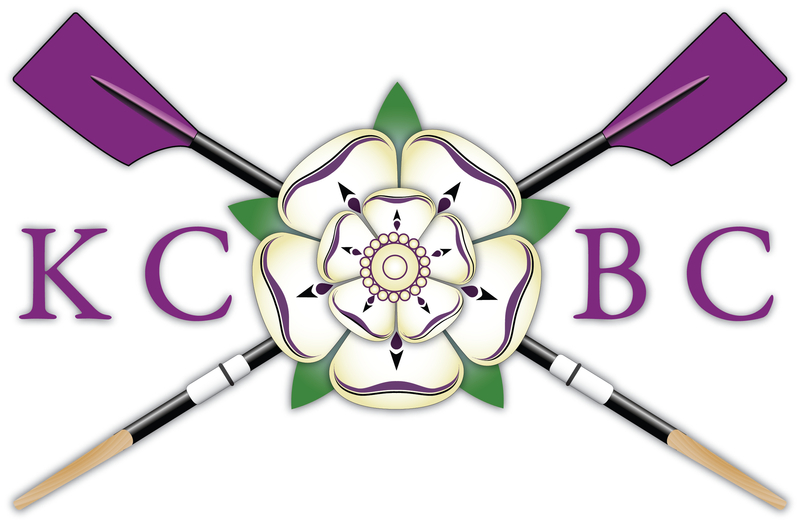 Support from everyone and anyone would be most appreciated on every day of Bumps, but in particular KCBC will be hosting our annual marquee on First Post Corner from about midday on Saturday 15th June. Our team at the marquee will be supplying refreshments throughout the day, from 10.30am – 6.30pm. The marquee is free to attend, and we will be selling a ‘Strawberries and Fizz ticket’ for £10. This ticket is worth 2 glasses of chilled fizz and a punnet of fresh strawberries with cream. Even more exciting than the Marquee though is the Boat Naming Ceremony for the new Women’s First Boat, which will be held at 10:30am on Saturday 15th June at the Combined Boat House. When it came to choosing a name for the new Women’s VIII one name sprang instantly to mind. Leo’s commitment to the Boat Club has begun to approach legend and as such she provides the perfect role model for female athletic achievement. Not only is she an accomplished rower (having competed for both College and University) but her commitment to the Club’s teams and committees over the years has proven invaluable. Her name on the bows of the new Stämplfi will preserve her hard work and dedication to the Boat Club and hopefully inspire every woman that rows in it to similar achievement.